Did you know that September is Better Breakfast Month? I was not aware, but curiously, we had a conversation at lunch today about all of the National 'this' Day and National 'that' Day and who is it that determines these things. So, when I learned that it was Better Breakfast Month, it only made sense that I do a checking to see who declared it. You know what? I found lots of articles and posts, but none seemed to cite where it originated. I have always heard that breakfast is the most important meal of the day. One article I found, shared about a report of the Dietary Guidelines Advisory Committee 2010 Study, that showed that children who eat breakfast perform better academically in school, behave better in school, have a more positive attitude toward school and are more likely to stay alert. I imagine, that good for you doesn't just apply to kids but is good for adults too. Admittedly, breakfast is one of my favorite meals. So much so that we often enjoy breakfast for dinner. (although, I'm sure Better Breakfast Month is more about the time of day than the food.) Pancakes, waffles, eggs, bacon and sausage are all dinner time favorites. We've even been known to enjoy a bowl of cereal or oatmeal at dinner too (especially on hectic nights). When I was younger (before I had children), I had a routine in the morning that involved a bowl of cereal and the morning news before heading out to work. Now that I am older (have children), it seems that I am squeezing so much into the morning (workouts, dishes, laundry), that breakfast is usually eaten in stages and frequently on the go or at work for me. Typically, my breakfast will consist of a protein bar or shake or a bowl of oatmeal and a banana. 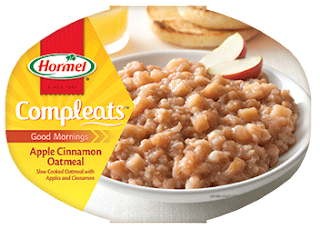 I used to rely on overnight oatmeal or a packet of oatmeal, but having tried a Hormel Compleats Good Mornings Apple Cinnamon Oatmeal a while back, it has become a regular option for a warm, hearty breakfast that I can enjoy at home or work. (My family also enjoys the Hormel Compleats Sausage Gravy & Roasted Potatoes, as well.) For the kids, I make sure that they have breakfast before I head out the door for work. Most mornings, their breakfast is cereal or oatmeal. What is your favorite breakfast? Do you eat breakfast type foods for lunch or dinner?